I was away for the weekend celebrating a big birthday....who needs big! and visiting pregnant daughter. One of the interesting things we saw was the cheche where grandson may be going. 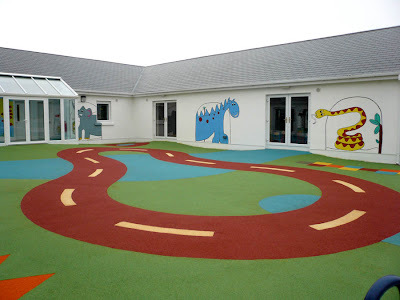 It has only been open about a month and is the most amazing custom built creche neither I nor she have ever seen. It even has its own chef!! 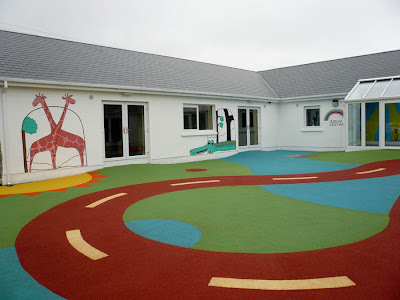 It was closed so we didn't get to see inside but look at that rubber surfaced playground and all the murals...wouldn't mind going there myself. 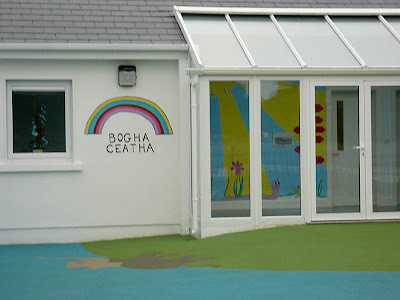 The creche is called Rainbow...cool or what. I think the baby room is by the giraffes. So why is that so cool??? Well let me tell you a story.... once upon a time there was a group of tatters watched over by a Leprechaun! So she ordered lots of copies of Jon's Snowflake book and then had another idea. That went down really well and the first tatter spoke up(well there is always one!) saying 'If we are going to tat Rainbow Snowflakes then I would like a Rainbow!!! Well the ring leader was getting that sinking feeling in her stomach when up popped the Leprecahun and announced that as he knew all about rainbows, best leave it to him!! hmmmmmmmmm! So she did...with great trepidation as to the mess that he was going to make....and some time later he presented her with a skein of thread. 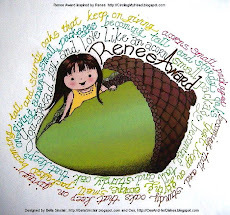 What had worried her was trying to get 7 colour changes into a circle a yard in diameter, that sounded just too many. Of course she could have made the circle larger but that was not going to be easy with her set up. But she needn't have worried not only had he got the 7 colour changes but 7 glorious intermediate ones as well. He did admit that yellow had been the most difficult, the house elf had said that yellow is only yellow when it's pure, and that's so true, the peachy orange looks orange and the limey green looks green. So he did need to exaggerate the length of yellow. Oh my!! it was beautiful, her favorite so far I think. She loved the subtle colour changes in some of my threads and you couldn't call this subtle. Even tho' it had so many colour changes they just flowed into each other like going round a colour wheel. Her mind was buzzing with the things that she could make with it, she felt that she could play with it forever and not get bored with it. Less of the fantasy and back to reality. 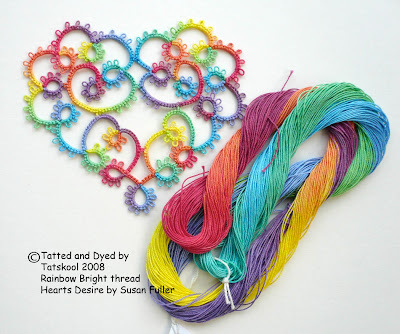 Mmmmm of course Susan Fuller's Hearts Desire...and of course Jane Eborall's SCMR Butterfly the best thing ever for using up any bits of thread, it only takes a yard. Oh I wonder what that will be like...this thread could be wonderful or awful!! Oh my...wonderful!! I name this thread RAINBOW BRIGHT.... it's so bright I need sunglasses to tat with it!!! oh my! 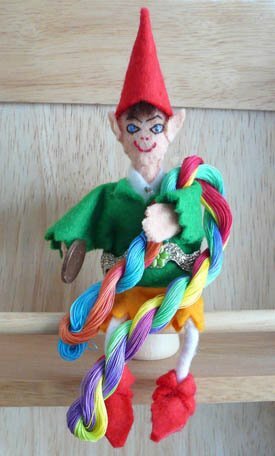 I can't even think how to show you the thread..if I twist it into a skein it will look like a jumble of colours. 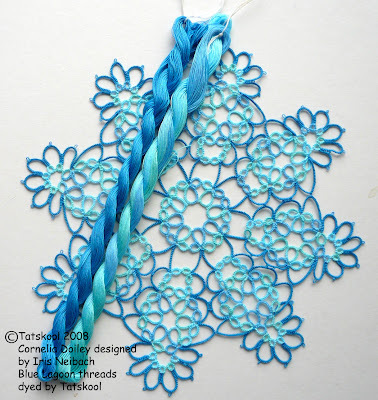 What else to tat... mm maybe dye some thread in the blue and tat a rainbow in the sky. 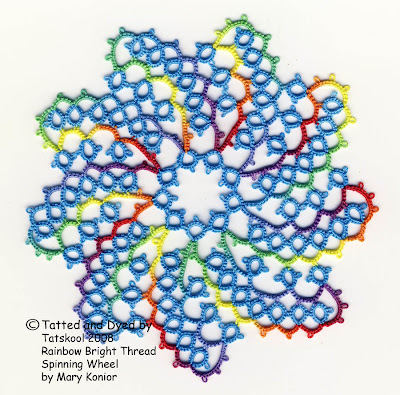 Tried Mary Konior's Spinning Wheel from Tatting With Visual Patterns and not sure if it is a success or not....too much sky and not enough rainbow, maybe the sky is too dark,but it is growing on me. I tatted this while I was away and I made so many mistakes, untatted them and didn't even know if I liked it, so when one huge mistake that I missed had me almost giving up, I decided to live with the mistake. Maybe you wont even notice it! It is tatted in size 40 thread and measures a little over 4 inches. It took about 15yds of the blue and about 3 and 1/4yds of Rainbow Bright. 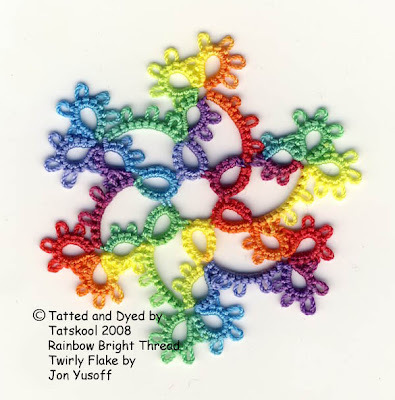 Now for my first Rainbow Snowflake, Twirly Flake from Jon Yusoff's Book of Snowflakes. This is also size 40, measures 1 and 3/4 inches and took about 4 and 3/4 yards.So loads of snowflakes from a skein. Oh! did I forget to say that I LOVE THIS THREAD!!!! 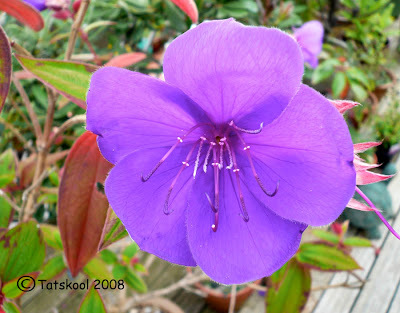 And tat da......the winner is Patricia who correctly guessed that it is Tibouchina urvilleana, in fact the house elf thinks that his is T.semidecandra but looking at Google it looks like this is the old name for the same thing. It is a native of Brazil highly recommended. Well done Patricia, a skein of Berry Burst will be on it's way to you real soon. Two more plants from our garden taken today and flowering their socks off and doing really well. 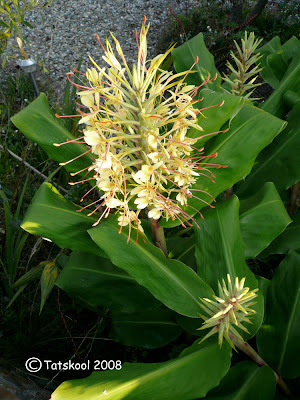 Hedychium cochineum has almost finished. 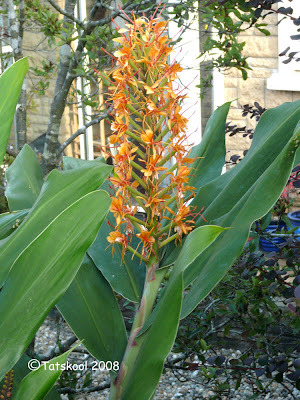 Hedychium gardnerianum is just coming into flower. Both are gingers, hardy with us. Oh my! today we have SUMMER...just when it's nearly too late...the sky is blue with those little fluffy white cloud things and the sun is shining...very brightly. The house elf and I, we just hate it when the weather forecast man starts saying 'There is a touch of Autumn in the air', or 'Autumn chill'. We shout at the television that we don't want to hear that word..especially in the middle of August!! Heck we haven't even has Summer yet!! We had almost given up on the Indian summers that we usually have in September...why did they have to leave it so late. So I am in 'end of Summer mode'. Season of mists and mellow fruit fullness sort of thing! One of our favorite plants is flowering it's socks off outside on our deck. Does anybody out there know what this is......It's OK I do know as the house elf is a plantsman and it's his! There is a skein of my latest HDT for the first person to leave a comment with it's name...sorry but Latin name only, common names don't travel well internationaly and it may have many common names from different countries.. It almost left flowering too late and got it's head blown off. It really is the most outrageous colour, I can't even begin to capture it. 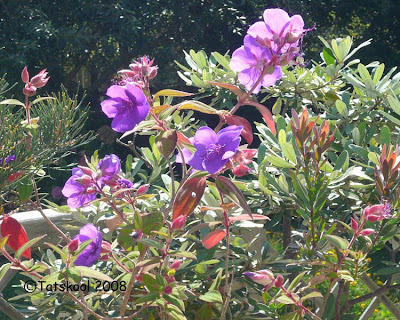 It's the deepest strongest violet I have ever seen and with the velvety leaves beginning to turn red...WOW. With the sun shining through it it looks so pale in the photo!! Now on to the next part of my colour theme. 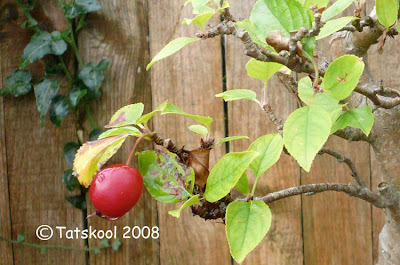 Remember my Bonsai Crab Apple Tree that was the impetus for my Apple Blossom thread....well I have rather ignored it in this wet, wet summer and left it to do it's own thing and this is what it looks like today, bearing not one but four crab apples. Oh dear that will probably mean less flowers next year as fruiting uses up it's energy. 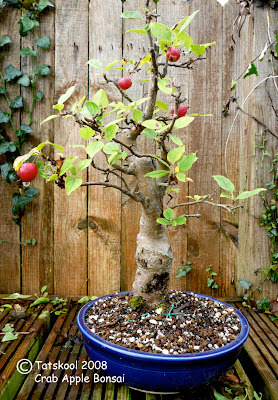 Remember also that I told you that while the leaves on a bonsai will become smaller, the flowers and fruit will always be full size. OK so keep these colours in your memory and we will move on. 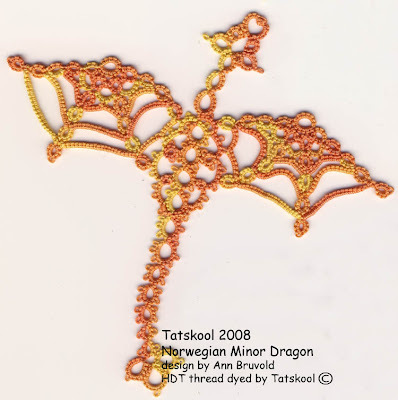 I have been tatting Ann Bruvold's Minor Norwegian Dragon ...if you haven't made this one yet then you are missing something good. 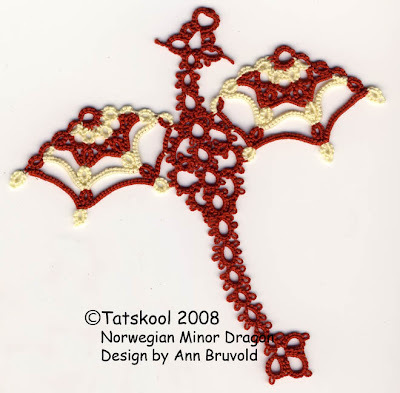 I have done Martha's dragon for my 25 motif challenge but the Norwegian Minor Dragon is in a whole different group! My first one was in two colours of Flora 20...practice piece! I was glad that I had used two colours so that I could be sure that I was using the correct shuttle. The colours in Ann's diagram are the ones of the working shuttles...like the diagram I did of Iris's Eleanora. The wings look like little umbrellas! Second dragon in one of my own threads. What to do my next dragon in, it was a puzzlement. None of my dragons fit the major dragon types that Ann listed so it was off to my stash of samples and trials that I did in the Spring. Mmmmmm Berry Dragon...I had 2 samples that would fill that bill. They originated in a curious way. I had so many little bottles of trial mixes to throw away, but it seemed such a waste soooh I grouped them together in threes and tried them out on small skeins, and put them on one side for later. 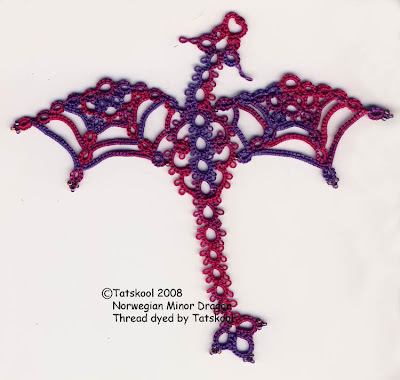 Well now it's later and one of them gave me a lovely Berry Dragon my favorite so far, even has beads. I loved the way the tail worked out. these dragons remind me of the Luck Dragon in the Never Ending Story... remember that? So lots of tweaking later and I have my latest HDT. Berry Burst! You can't believe how difficult it is to show you the correct colour so lets imagine......and get your juices running........ well, over here in our supermarkets you can buy bags of frozen mixed berries to make pies. So imagine, redcurrants,cranberries, raspberries, loganberries and strawberries going into my pan. Then lets add bilberries, blackcurrants...and then blackberries and blue berries. Making my mouth water I don't know about yours!! Well when the berries get hot they burst and their juice comes oozing out into little pools which gradually mix. With me so far!! well that's my Berry Burst...I wanted such an intense colour palette that I dyed it twice. Sometimes threads look so nice when they are wet that I an sorry that they have to dry much lighter. 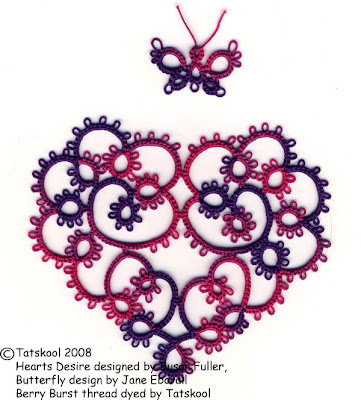 Here is my finished 'Berry Burst Dessert', Hearts Desire by Susan Fuller and Jane Eborall's SCMR butterfly both my favorites in HDT's. 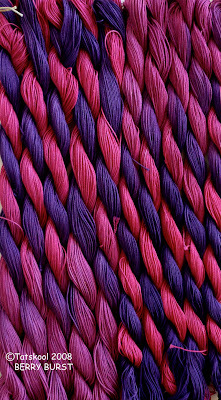 BUT having dyed all my threads I suddenly began to wonder if Yarnplayer or LadyShuttlemaker had dyed the same colours, heart in my mouth I checked them out and found.....Yarnplayer's Purple Punch.....very similar but on closer inspection I think mine is VERY much darker. She also seems to have light areas in hers unlike mine. Oooer! I hope that mine is different enough...I think it is and it was dreamt up long ago. It just occurs to me that I didn't give you the thread amounts for my Blue Lagoon Cornelia in the last post. I know that everyone with HDT is as paranoid as me about running out of thread in a big project...that's why I always have to test tat at least a part first, to calculate possible amount needed. Well the doiley took 40.5m (44yd) of the HDT in size 60.... I didn't measure the solid blue this time but reckon it would need approx 24m (26yd). Dont forget you could need more as I am a tight tatter but this will give you an approximate idea, and don't forget this is size 60 amounts. 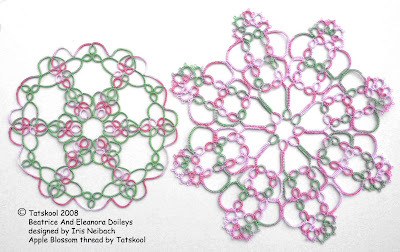 This is a very easy pattern by Iris Neibach from her book 'Tatted Doilies' and it looks stunning. Sooh I just had to try it in my HDT. 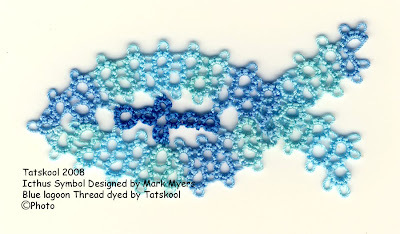 Blue Lagoon was the choice as I am in my 'Blue Lagoon season'!! 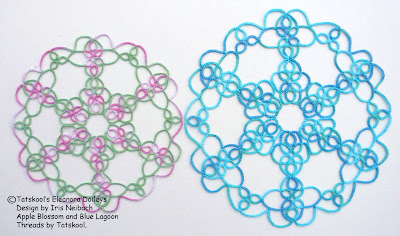 I love the way this pattern works out, isolating the groups of rings. I kinda think this looks like lots of little lagoons in the ocean. I dyed some of the deepest colour of Coral Reef to make a good contrast round the lagoons. 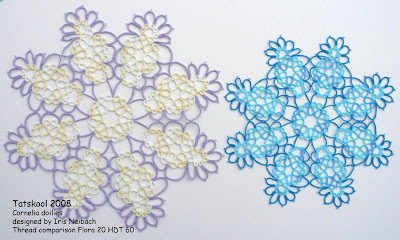 This one was made in size 60 and gosh it is so tiny and delicate, here is is alongside the first one in Flora 20. I have to confess that having given the lemon and lavender one to my son I am making another one like it!! Getting tired of blues next post will be a new colour. 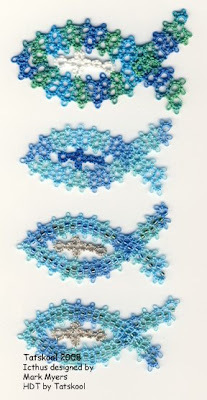 This is another Fish for the 25 Motif Challenge...this first was the Seahorse. 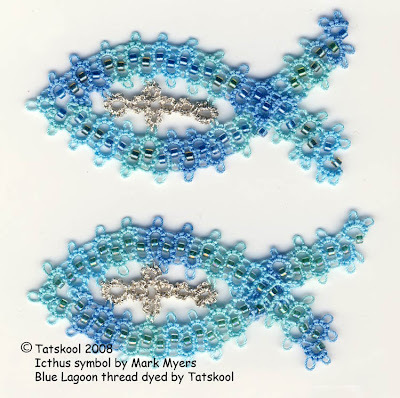 This fish comes from the hatchery of Mark Myers and represents the Icthus symbol. 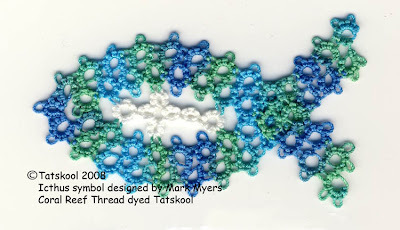 I first tatted it in my Coral Reef thread in Size 20, it measures 7cm (just under 3in) and takes about 5m (5.5yd) of thread. Next I tried my Blue Lagoon thread in size 60. I don't usually tat with thin threads so this was an experience, I worried about problems with untatting but I needn't have as this thread was a dream to tat with. I just love the way this pattern show up the progression of the gentle colour changes in Blue Lagoon ..... mmmm must try this with my other HDT's. In 60 it measures 6.5cm and takes about 4m (4.5yd). 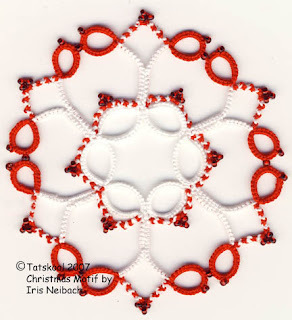 I LOVE this pattern so lets add some delica beads!! and some silver thread for even more sparkle....Oh My!! Here they all are together to show the size. 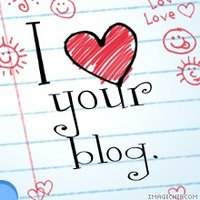 I love your blog award. TattyCat (Laura) and Ridgetatter(B.J.) 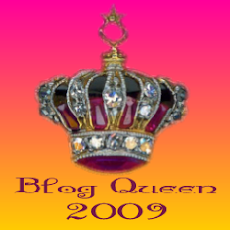 have paid me the greatest honour by awarding me the I Love Your Blog Award. This is the icing on the cake for me..it makes all the effort of blogging worth while when you know someone likes it enough to do this. I love every award and every comment that is written...bloggers need this 'fix' to keep them going, so do please leave your comments. I am so very busy at the moment trying to dye threads and get my shop up and running that please forgive me if I don't single out some blogs to give it to...maybe later as I know it would mean a lot to someone else too. I have 70 blogs in my Google Reader that I am notified about as soon as they are updated and I love each and every one of them...how can I choose just 7!! My first doiley from Iris Neibach's book Tatted Doilies was Beatrice...you may remember I made it in Flora 20 bright yellow and the in my Apple Blossom 20 I chose it because it looked to be the easiest and because others had posted about it so it must be OK.Having got the knack of the one round into the centre and out again..yes it was easy and straightforward. The next one I chose was Eleanora because that looked easy too. Well I was wrong it wasn't easy at all!! My trial in Flora 20 was a masterpiece of untatting! I had printed a pale copy of the photo and coloured it in but even when I had completed it I was not too sure how I had actually done it. 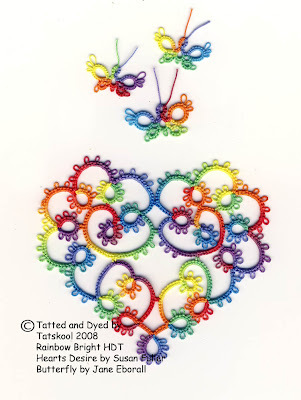 Inattention to the diagram in the book caused my first mistake, tatting the chain past Ring 3 which is thrown off it...untat back a lot...wont do that again. Then there were several places where I would finish a chain, tat the next ring and the realise that I was going in the wrong direction for the next chain to be made. Untat again and use the other shuttle for the ring and I was fine. For my second attempt I realised that it would be a good idea to colour my diagram according to which shuttle I was using and after that it was a doddle!! I asked Iris if I could show you my diagram and she was happy with that, so here it is. The rings are numbered consequitively so you can follow the flow easily. You can see where to change shuttles, the red parts are made using Shuttle 1 as the working shuttle and the green parts use Shuttle 2 as the working shuttle. This is not the way I would normally colour a diagram...proof of this is that I made the mistake of telling you that it was like this on the diagram that I made for the Christmas motif in my last post. Not so..that was the colour that the rings and chains would look like in the finished item...I have corrected this. 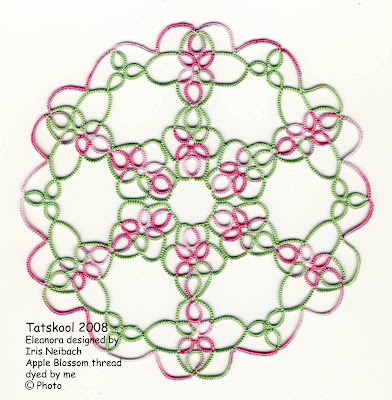 Well I fooled myself too as for my next attempt I decided to use Apple Blossom 40 and a co-ordinating green and imagined it looking like my diagram with a green outer edge. I am not used to tatting in anything other than 20 so it looked TINY! Colour balance difficult to get right on that photo and they wont both fit on the scanner. Second thing to strike me was how different the Apple Blossom looked. I designed it to be mostly pinks with just a hint of green leaves and now suddenly it was mainly green. Wow! just shows the different ways to use HDT's. Designers all write their patterns slightly differently, of course they do....there is no right way or wrong way. They are all such gifted people and I am sad that I do not have their talent for originality. But maybe I can express my thoughts on what I like to see in a pattern. 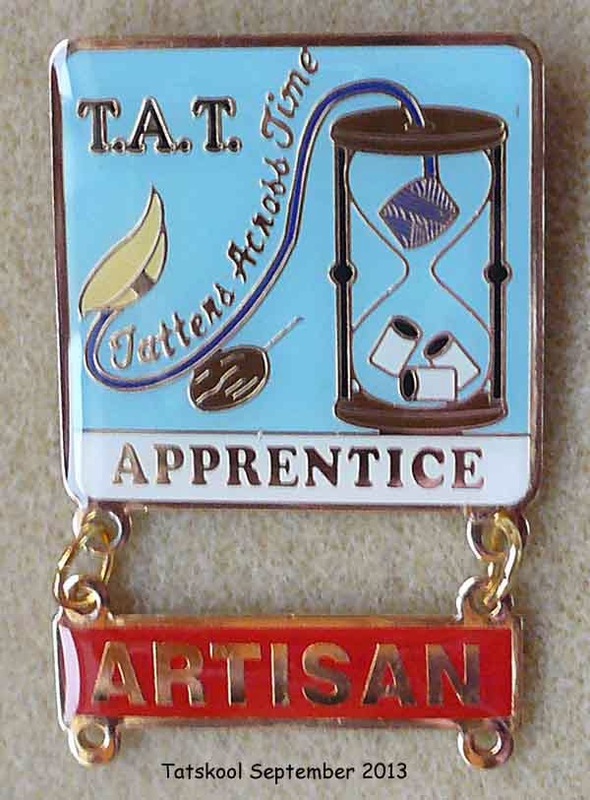 When I started to tat way back in the ice age! all the patterns that I possessed were written in a very long winded way with photographs of the finished piece but no diagrams. This I accepted as the norm. Now when I see a pattern written like that, particularly for a doiley, with what seems like pages and pages of text without even a pause to come up for air!!! my brain shuts down. I know that if I go and make a cup of tea in the middle of the pattern then when I come back I will not have even the faintest idea where I was. I will usually scan the photo as well as the text, write out the text as I go in a shorter way and print the photo in light grey (sometimes need to invert the black and white photo to do this) so that I can write on it and colour it as I go. Modern patterns are a doddle to follow compared to these. 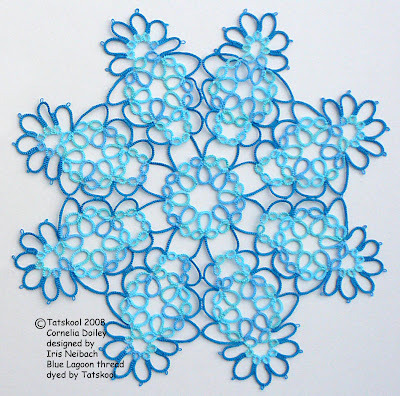 My favorite pattern writer has to be Jane Eborall who kindly shares all her patterns freely,and goes to such pains to make them as followable as possible. 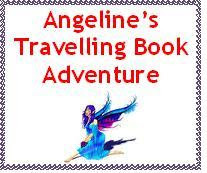 From Jane we get full written instructions as well as lots of diagrams with rings and chains usually numbered to help us see the pattern clearly in our minds and know exactly where we are going next. All following Jane's patterns requires is a tick against each line when it is completed. Most other designers write their patterns somewhere between these two extremes and it is up to us to add our own notes to the printed page. Many come with good text and a clear photo, some with a photo and just a diagram. A good diagram can be worth a thousand words but sometimes a few words as well would help a lot. 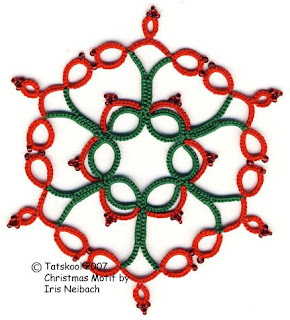 My first experience with the patterns of Iris Neibach was about this time last year. 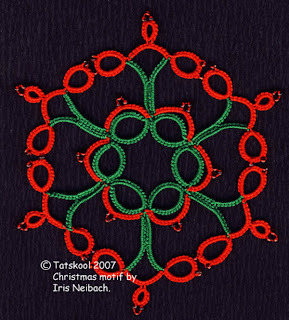 I was looking for something to kick start my Christmas tatting and looked through my collection of saved patterns. 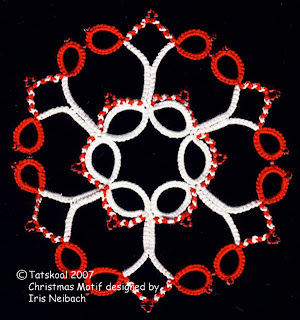 Iris had posted a free pattern for a Christmas motif as a gift to her tatting friends for Christmas 2002. Going back to her site I could no longer find it there. Lucky me to have saved a copy. The pattern showed a photograph of the finished motif and what it might look like as a mat of multiple motifs and a diagram of a segment of the motif with stitch counts on it. I would have liked a diagram of the whole motif but I am not a wimp! so guessed I could follow it ok, the motif was so stunning that I HAD to be able to do it. 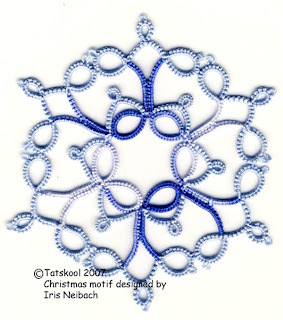 Iris is a tatting genius in my opinion and this was the first pattern that I had ever tried which works from the outside into the centre and back out again,allowing the complex motif to be made in one round. This was my first attempt, when I got back to where I started having put my magic threads in the last ring or so I thought... I found that I had already done that ring at the very beginning!! Now I know that I could have corrected this by untatting that ring but I would still have been one magic thread short....so I decided to keep it like that to remind me of my inattention to the pattern. Had I been able to colour the diagram as I went then I would have seen that I had already tatted that ring. At this stage I decided to draw a complete diagram numbering the rings and chains to show how the design progesses and then colour it in as I went along. After that it was easy and I produced several of them. This I guess was my very first rainbow snowflake. Playing with beads and Christmas colours this looks dramatic on a black background. But this is my all time favorite, it reminds me of the ferris wheel at a carnival. 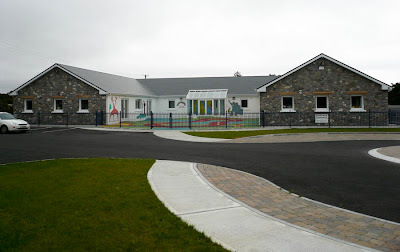 I recently sent my photos and my diagrams to Iris as I didn't want to cause any offence to her, asking permission to post them on my blog to help others. Not only did she say yes but she asked my permission to post them on her blog!! Thanks so much for the compliment Iris. So here is my diagram to help you, I sincerely hope it will be useful. The progression is numbered consequitively be it ring or chain. Just follow the arrows and change shuttles where necessary. The red and green are the actual colours you will get using two shuttles. Yup I do know that I missed out number 29...just checking to see if you were paying attention!!! 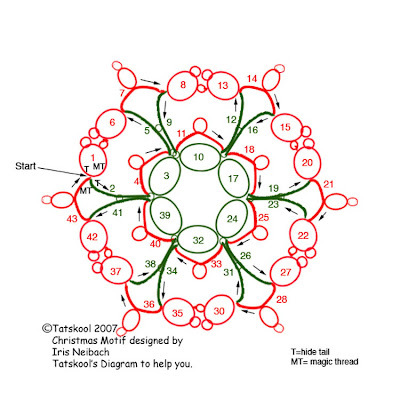 I also did a diagram to show the stitch count but you dont need that you can find the pattern here on Iris's website as it is now back on line for you all. These were my first ever attempts at drawing diagrams. Iris, I love your designs. The motif made in size 20 takes about 5.5 metres(6 yds) on Sh1 and about 4 metres(4.5yds) on Sh2..don't forget you made need more. I think this will look nice in HDT...Go tat!!! 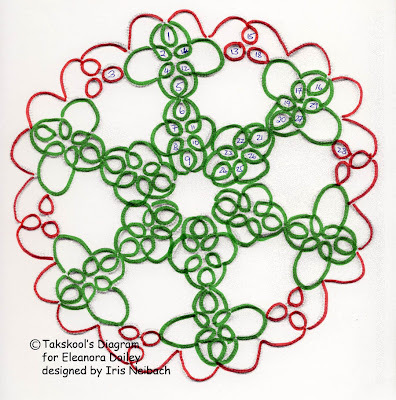 Iris also posted my diagram for Eleanora but I will explain that in my next post. Hope you can wait.